Jasda Physiotherapy’s underlying philosophy is to provide senior Australians high quality physiotherapy solutions that allows them to optimise their mobility, increase their independence and enable them to lead more active and fulfilling lives. We believe in incorporating our core values into all aspects of our work ethos. Jasda physiotherapists are passionate about providing the best physiotherapy treatments for all of your aged care residents. Working on an individual basis with seniors and their associated facilities we aim to consistently improve and develop our reliable techniques to ensure our clients receive positive and tangible results. The team at Jasda Physiotherapy is dedicated to creating a nurturing environment for your residents and always strives to maintain a close, respectful, and inclusive relationship with partner facilities. We are mindful of the needs of our individual clients and honour the relationships we develop over time, celebrating successes and patiently assisting our seniors to reach their desired milestones. Jasda Physiotherapy is continually searching for innovative ways to improve our services in order to provide tailored solutions for your aged care residents and build on our outstanding professional skills. 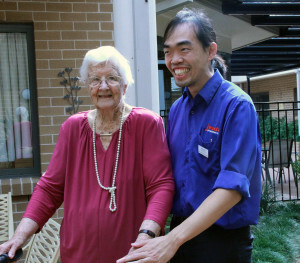 We are committed to inspiring our team and aged care partners to finding a better way, so we can help each resident live a healthier, mobile life. We foster business relationships that are based on trust and respect. We care about treating each resident as a unique individual and tailor our treatment to their needs. We are honoured to be part of their stories and as such, encourage their uniqueness. Jasda strives to be consistent with all our work with residents and our engagement with facilities through our robust approach to our work.